This equestrian sport is increasing in popularity with all ages and abilities. 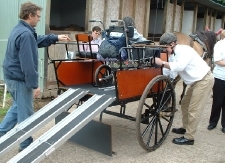 There are few limitations to carriage driving and it is an accessible and superb sport for those with a disability. Often a riding pony outgrown is motivation for interest but as a sport in its own right driving is great fun. 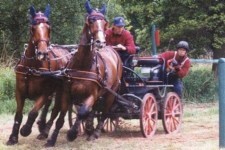 We offer carriage driving tuition and expertise (singles/pairs) with our well-schooled horses from absolute beginner. 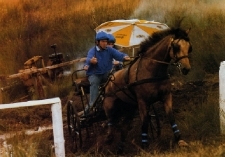 Driving training is using Coachman Rein Handling technique. Pleasure, or Horse Driving Trials is our speciality. All tuition is one-to-one and so based on individual needs & learning curve and taking into consideration objectives. Private tuition with your own horse/s can also be arranged or guided drives out. Learn how to assemble a set of harness and fit to horse. How to 'put to' to a 2 or 4 wheeled vehicle. 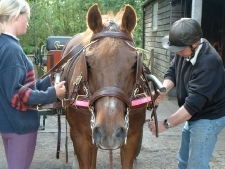 How to hold the reins and guide the horse in the direction and pace you require in the safe confines of our premises. 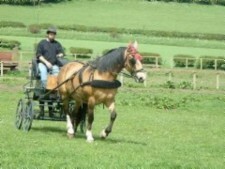 Carriage driving taster sessions will be available as an introduction and gift vouchers are available. For those who are wheel-chair bound or semi ambulent and want to drive horse-drawn carriages, we have an easy loading specifically designed and manufactured vehicle. Because our training is based on individual's needs we are delighted to discuss specific requirements for people with disability. Also see details regarding our holiday cottage for provision for people with disability. Once you''ve mastered a single horse you may wish to advance to pairs. Imagine the excitement, skill and awesome power achieved by driving say a pair of horses cross-country or through an obstacle or cones course. Driving/Riding Holidays: Will be personally quoted based on prices on that page as these are tailored to customer’s requirements. Alternatively you can let us know your available spend and we will be pleased to advise on an appropriate tuition package.